I love that time of the year when all brands launch the most beautiful beauty summer products. When I look the package I instantly fell the summer and think about the hottest destinations. Not to mention the fragrances that take me on a getaway right away. Terracotta Pause d'été (Limited Edition): This gorgeous powder for face and décolleté is combined of terracotta shade with a pink color on the middle and gold shimmer. It's perfect to accentuate the sun-kissed skin glow. The two shades can be applied separately but I prefer to mix them and apply starting by the forehead to the cheekbones and down to the chin. The texture is very soft, comfortable and lasts all day. That's a must! I also love the concept of environmentally sound wooden package. 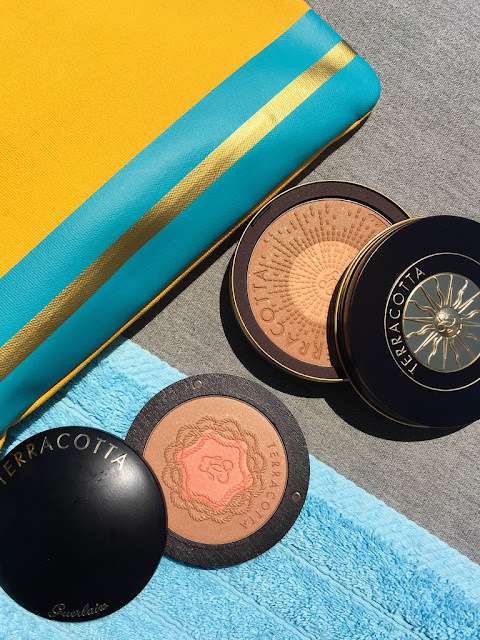 Terracotta Terra Magnifica (Limited Edition): This bronzing powder with terracotta and sand shades also contains slight gold shimmer. I also like to blend the shades and apply it drawing a 3 shape. Then I take a bit of the light shades to highlight the top of the cheekbones, nose and lips contour. 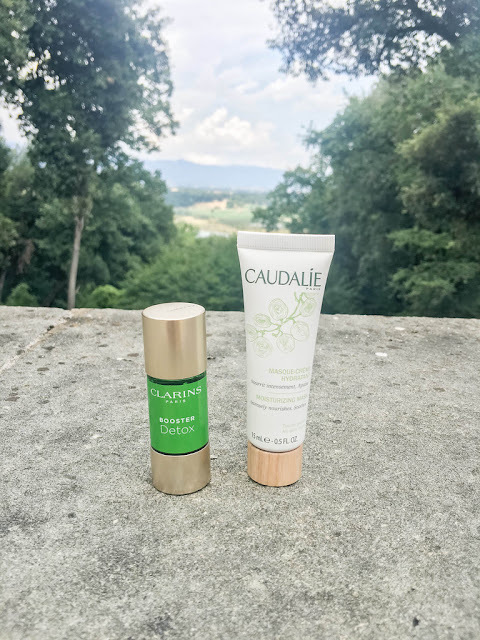 Caudalie Huile Divine : Actually this oil is for body, face and hair. But I prefer to use only on my body skin. I love it and my favorite way to use it is right after the shower while my skin is wet. Then I rinse a bit with water and dry my skin normally with a towel. Afterwards I apply my body lotion. You guys must try as the skin becomes super hydrated and with a solar fragrance. 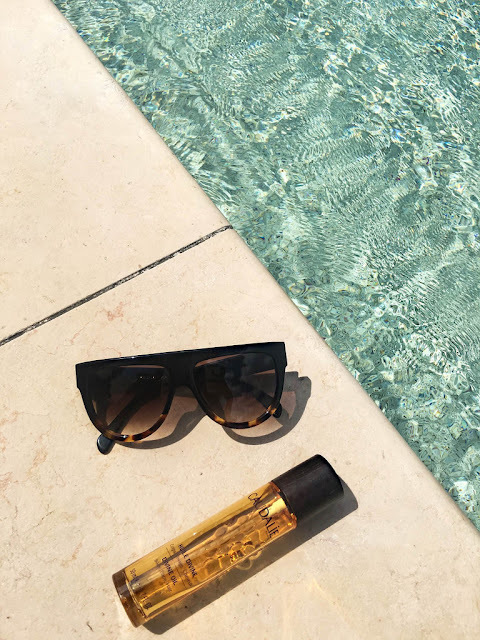 Terracotta Sun Protection SPF30 (Limited Edition) : I loved discovering this moisturizer sun protection by Guerlain and I was totally impressed on how it activates and accelerates the tan so quickly. I use on my whole body and it's my favorite sun protection actually. 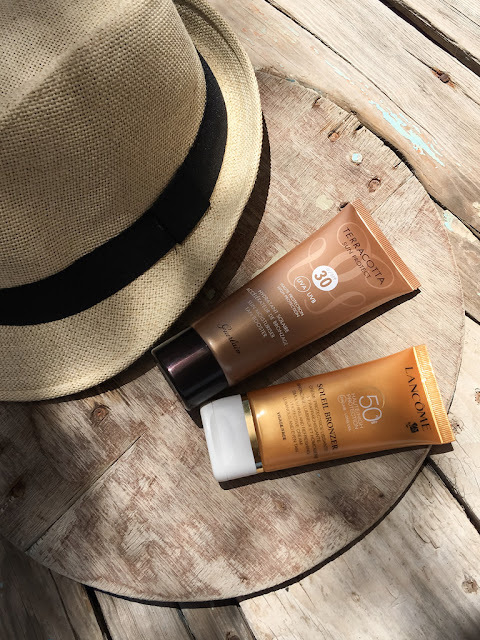 Lancôme Soleil Bronzer SPF50 : I always use high protection when I am going to be exposed to the sun and specially on my face. This moisturizer by lâncome has a perfect light texture and smell so good. It really protects and allow an smooth effect to the skin. Booster Detox by Clarins : When I feel that my skin is really tired and need a boost, I mix on the palm of my hands my moisturizer and 3 to 5 drops of the Clarins detox booster. When I use it I feel like my skin is detoxified and radiant. This booster is available at clarins.ch. Masque-Crème by Caudalie : I love doing masks and this one from Caudalie is super hydrating. Sometimes I put before going to sleep and wake up with a renovated skin.